iCatholicD provides: direction to catholic churches, contact information, today's reading, driving directions, etc. It includes more than 150 catholic Archdioceses/Dioceses located within the 50 states in the US; only affiliated catholic churches. Download the App! and discover if your church is included! Map view shows Catholic churches nearby. 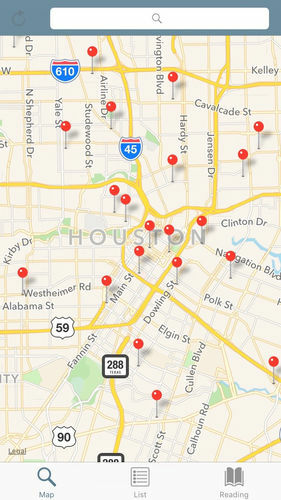 Tap and hold on a specific location to show churches nearby; ONLY within the United States. List of nearby Catholic Churches. 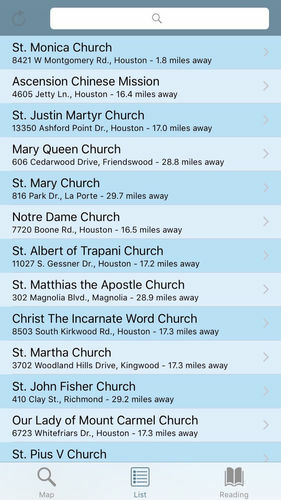 Tap on Search text field to quickly find a church by name. Find detailed information on selected Catholic church; email, call, visit church website, or use turn by turn navigation to church. Read, listen, reflect and discuss the daily readings for Mass.